A stunning floral gift for that special someone who appreciates creativity! 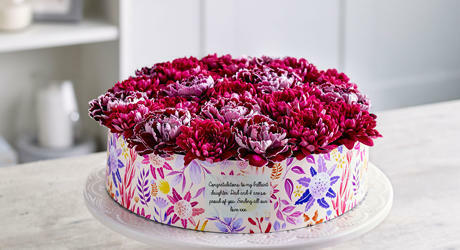 These beautiful ‘cake’ shaped arrangements feature spray chrysanthemums and carnations in gorgeous shades of pink and burgundy. Perfect for Mother's Day, the wrap can be personalised with your own personal message to make it even more unique.